Inviting people to your wedding can be quite the challenge for most couples. While having your closest friends and family members is always the best way to keep things intimate, there’s that pressure of not wanting anyone to feel left out. But before you even consider your best friend’s brother-in-law and your uncle’s girlfriend being a part of your special day, make sure to take the allocated budget and the venue’s capacity into account when finalizing your guest list. 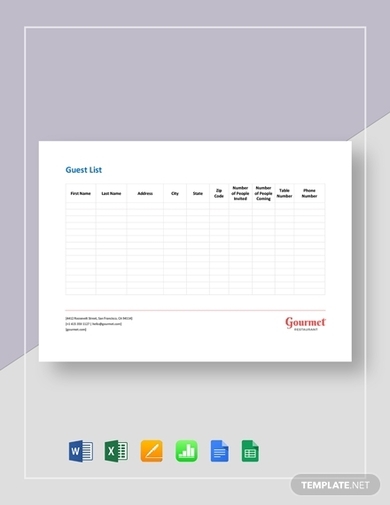 The list templates should serve as a guide for you to know who to prioritize when sending your RSVP cards. Pondering on who you want at your wedding is much easier when you don’t have an actual wedding plan to construct. Otherwise, you might need to filter out your list of a hundred potential guests to a fewer, but more reasonable, fifty. It’s a good idea to begin with a list of guests to prioritize. This should comprise of your immediate family members and closest friends and colleagues. 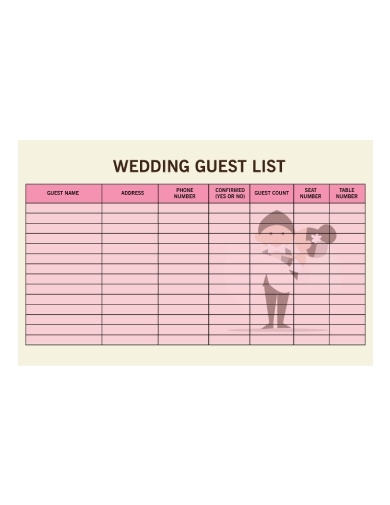 You can use a wedding guest list template to note down pertinent information regarding each individual, such as their name, address, phone number, and table assignment. 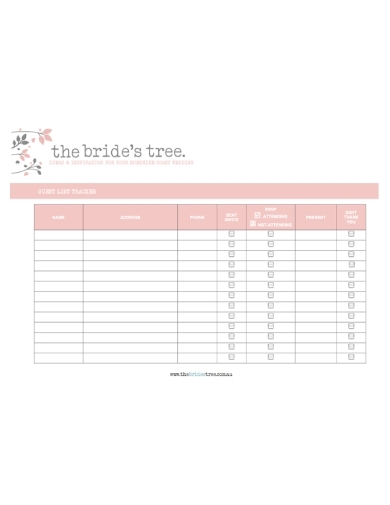 Not only will this guide you in drafting your seating chart, but this will also let you know who to send your wedding invitations to. 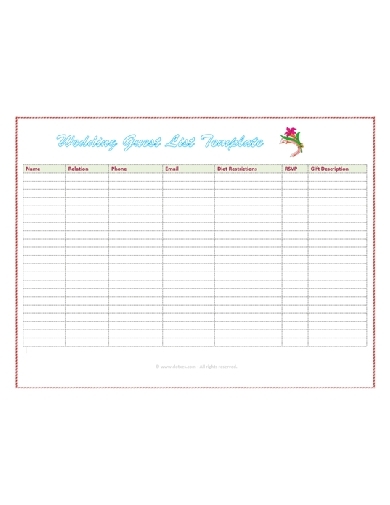 You can print several copies of the template for you and your wedding planner to use as a reference. 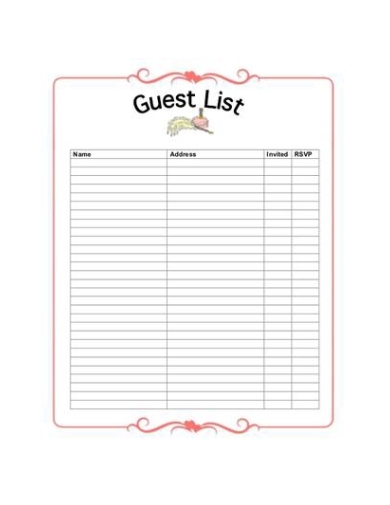 Feel free to customize the content of the template if you need to in order for the guest list to cater to your exact needs. Wedding planners are held responsible for nearly every aspect of a wedding. While some decisions need to be consulted with the bride and groom before they may be finalized, the wedding planner is usually in charge of the specifics of a wedding to spare their clients from the hassle. For one, wedding planners often have their own version of a guest list that they utilize to note down which invitations were accepted and which were declined. As much as you yearn for the presence of certain individuals on the day of your wedding, not everyone can commit it to it due to prior obligations and other priorities. Nevertheless, most people are courteous enough to decline your invitation beforehand to offer you enough time to make the necessary adjustments. This should be reflected in your guest list through constant follow-ups and regular updates. If you’re planning a large celebration for your wedding, it’s important to keep your guest list as detailed as possible. This will make it easy for you to get in touch with anyone who’s on the list. You can write their name, phone number, and address, then indicate whether they have confirmed their attendance or not. Once this has been settled, you can begin assigning seat numbers and table numbers according to your proposed seat plan. Doing so will help keep you organized during one of the most hectic weeks of your life. Also, always remember to update your guest list on a timely basis, especially when last-minute changes need to be made for your caterer’s convenience. Although you can always print a copy of the list for your own use, it’s best to create a shared document online that may be edited or updated directly by those who have access to the file. Some brides and grooms can be very particular about who comes to their wedding along with the role that each guest is meant to play at the ceremony. Since it isn’t necessary to have all your friends as bridesmaids and groomsmen, it’s best to let them play another role that’s more practical. In some traditions, couples are given the privilege to choose the gifts that they receive from their guests. Here, each individual in their guest list may be assigned with a gift to give to save them from the struggle of searching for something that the married couple might actually need. This type of wedding list is a professional technique for couples who want to make sure their guests are being realistic by providing gift ideas that are valuable. Wedding guest lists don’t always have to be complicated to be effective. For smaller, more intimate functions, it’s best to stick with a simple wedding guest list. 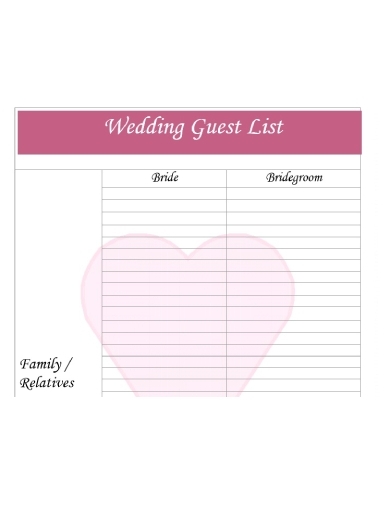 The list will simply carry the names of those invited to the wedding from each party involved. This is perfect for couples who want to keep their wedding private and exclusive to immediate family and friends only. This is also a good method for couples who are planning their own wedding without professional help, as sending your invites can easily be done over the phone or through a card. It’s a good idea to use a tabular format as well, as it’s much easier to find the information you need when items are listed in separate cells. It’s often difficult to manage an event as massive as a wedding. Think about the number of guests you want to invite, not to mention your means of reaching them and making sure their attendance is confirmed before your seat plan may be finalized. Thus, one of the best ways to ensure you have everything under your full control is to use a tracker for your guest list. This can come in the form of a wedding checklist so you can easily cross out items that have already been settled. Staying organized is key to planning and running a successful celebration for you and your partner to enjoy.